Deuterium and tritium are substances with a future - but they are rare. The heavy isotopes of hydrogen not only have numerous applications in science but could also contribute to the energy mix of tomorrow as fuels for nuclear fusion. Deuterium is also contained in some drugs that are currently undergoing regulatory approval in the US. However, the process of filtering deuterium out of the natural isotopic mixture of hydrogen is at present both difficult and expensive. Scientists from the Max Planck Institute for Intelligent Systems, the Max Planck Institute for Solid State Research, the University of Leipzig, Jacobs University Bremen, the University of Augsburg, and Oak Ridge National Laboratory (USA) may be able to remedy this problem. They have presented a metal-organic framework compound that can be used to separate the two isotopes from normal hydrogen more efficiently than previous methods. In drugs, deuterium has a life-prolonging effect – albeit initially only for the active substance itself. The human metabolic system breaks down molecules carrying the deuterium isotope, which is twice as heavy as hydrogen, more slowly than the same substance incorporating normal hydrogen. Drugs containing deuterium can therefore be given in smaller doses, which means that their side effects are also reduced. Deuterium, like the even heavier radioactive hydrogen isotope tritium, also plays a role in nuclear fusion. This process, which makes stars shine, may some day fuel power plants in which atomic nuclei are fused together, releasing large amounts of energy in the process. Whereas deuterium has only been used in pharmaceuticals for a short time and its potential use in power plants still lies in the future, it has long been used in science, for example to track the path of nutrients through the metabolic system. "Deuterium and, to a certain extent, tritium are useful in some applications," says Michael Hirscher, who, as Leader of a Research Group at the Max Planck Institute for Intelligent Systems, has played a key role in the research. "To date, however, it has been very difficult to separate deuterium from light hydrogen," he says. Deuterium is obtained from heavy water, which occurs in natural water at a concentration of just 15 parts per thousand. The heavy water is first isolated by a combination of chemical and physical methods, such as distillation, to obtain deuterium gas. The whole process is so intricate and energy-intensive that a gramme of deuterium with a purity of 99.8 percent costs around 100 euros, making hydrogen's heavy brother around three times more precious than gold, although deuterium is more than 300 times more abundant in the oceans and Earth's crust than gold. "Our metal-organic framework compound should make it easier and less energy-intensive to isolate deuterium from the naturally occurring mixture of hydrogen isotopes," says Dirk Volkmer, whose colleagues in the Department of Solid-State Chemistry at the University of Augsburg synthesized the material. In a metal-organic framework, or MOF for short, metal ions are linked by organic molecules to form a crystal with relatively large pores. Such substances are able to absorb large quantities of gas in relation to their weight. In the compound that the research team proposes for use as a deuterium and tritium filter, zinc and copper ions form the metallic nodes. As early as 2012 the scientists presented a metal-organic framework compound containing only zinc as the metallic component. It was able to filter out deuterium – but only at a temperature of minus 223 degrees Celsius. 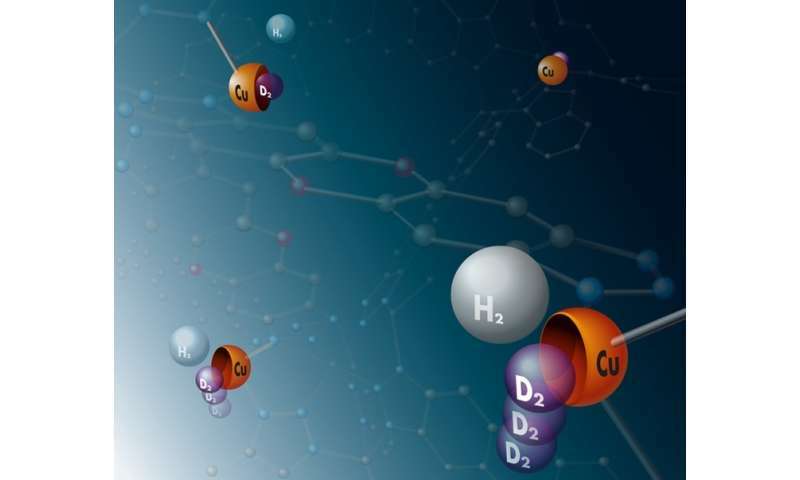 The Augsburg-based chemists therefore replaced some of the zinc atoms with copper atoms, whose electron shells more selectively filter out deuterium and does so at higher temperatures. Michael Hirscher and his staff at the Max Planck Institute for Intelligent Systems and researchers at the Oak Ridge National Laboratory confirmed this property in various tests. Among other things, they determined the quantities of deuterium and normal hydrogen that the material absorbs from a mixture of equal parts of the two isotopes at various temperatures. They found that at minus 173 degrees Celsius it stores twelve times more deuterium. "At this temperature the separating process can be cooled with liquid nitrogen, which makes it more cost-effective than methods that only work at minus 200 degrees," says Michael Hirscher. The team of theoretical chemists headed by Thomas Heine, who has recently assumed a chair at the University of Leipzig after previous teaching at Jacobs University in Bremen, helped interpret the collected data. "Our calculations fitted the various parts of the experimental puzzle together into a coherent picture," the scientist says. The data for deuterium and normal hydrogen showed that the predictions of the calculations agreed very well with the experimental results. The theoreticians are therefore confident that those calculations, which cannot easily be tested experimentally, are just as valid. "Our calculations for tritium would probably be right too. But this can only be experimentally confirmed under stringent safety procedures," Thomas Heine says. The material also absorbs the radioactive hydrogen isotope very efficiently from a mixture of isotopes. That could be a useful property in a particular application in which the aim is not to obtain the isotope but to get rid of it. Water from power plants – including the water that flooded the Fukushima reactors in the 2011 disaster – contains tritium. The new metal-organic framework compound may provide a way to dispose of this radioactive waste, although the radioactively contaminated water first has to undergo electrolysis to convert the tritium-containing water molecules into tritium-containing hydrogen gas. However, before tritium and deuterium can be filtered out of the isotope mixture using large-pore crystals in practice, the technique first has to be refined – not least, so that it absorbs more gas. Neutron scattering is a very sensitive tool to study the motion of hydrogen, the neutron also distinguishes the signals coming from different isotopes like hydrogen and deuterium. "In the metal organic framework, hydrogen molecules adsorbe on different sites, by tracking the relative populations of hydrogen and deuterium in each site, neutrons clearly elucidated the mechanism of isotopic separation." Timmy Ramirez-Cuesta, from the Spallation neutron scource at Oak Ridge National Laboratory says. The research made use of ORNL's VISION spectrometer, the world most powerful chemical neutron spectrometer.